When you are ready for any type of camping trip you will want this Flying Cloud 26RB which can accommodate your family of four. The u-dinette is spacious enough for your whole family to gather for your meals and after dinner you can sit here and play a few games. 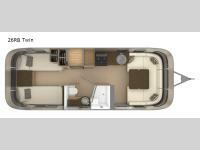 The dinette also converts into sleeping space for your kids and in the rear there are two twin beds. You will appreciate the side aisle bathroom which has a toilet, sink, and shower.